One of the emails I get all the time is pretty basic: “If I want to make family dinner happen regularly, where do I start?” And in spite of 650 blog posts, my next book coming out on that very topic, and, oh, roughly 5000 family dinners logged in my own house at my own kitchen table, it’s still one of the harder questions to answer. I like to think this is not because I am incompetent (though the jury is still out on that one) but because I am a realist. The truth is, family dinner is not an easy thing to make happen, and any blogger or magazine article or cookbook author who claims otherwise (“Family Dinner in Five Easy Steps!”) should be viewed with a healthy dose of skepticism. The way I see it, like anything, there are different levels of the game, and if you concentrate on mastering one level at a time, and building from there, it’s a lot easier (and more long-lasting) than just assuming your family of athletes and picky eaters and late workers and on-again, off-again vegetarians is going resemble a Norman Rockwell painting on the very first time you try. (And by the way: Is there anyone left who believes that a Norman-Rockwell-imagined world still exists?) Here’s the way I see it progressing, with the subtext being that EVERY LEVEL QUALIFIES as family dinner. This is where you start. Forget about the food and just focus on logistics. Get everyone sitting around the table at the same time. Try to make the event last more than six minutes. If you can pick three or four days during the week to make this happen, you can consider yourself ready for Level 2. Level 1 menu ideas: storebought Rotisserie Chicken with a basic salad; packaged dinners you feel good about, or something from the freezer like Meatballs. So you’ve mastered the logistics. Now it’s time to focus on the food. Don’t panic and don’t put too much pressure on yourself to make something overly complicated. (This is supposed to be fun, remember?) Take a step up from storebought foods and prepare something homemade that’s simple enough to make on autopilot (spaghetti with marinara? Omelet? Your grandmother’s famous curry?) Don’t feel bad about supplementing with a peanut butter sandwich if someone at the table protests. Just try to make that peanut butter sandwich with whole wheat toast and good-quality peanut butter. In our house, dinners that qualify for Level 2 are: Pizza, a Baked Potato bar; or a Roast Salmon with mustardy-dill yogurt sauce. OK, if we were talking college sports here, I’d say you’re getting into Division 1 territory here. If you feel like you’ve sufficiently nailed down Levels 1 and 2, you can start to think about cooking one thing that everyone will eat. This is, of course, where Deconstructed Dinners come into play: Indonesian Chicken Salad, Tortilla Soup, Salmon Salad (page 62, Dinner: A Love Story) are all great choices, but if you have meals that fall into this category I’m always interested in hearing about them. Always! This level is actually the whole reason I wrote this post. In fact it was supposed to be the whole point of the post — the idea that we have been going all flexitarian lately, eating less meat, following the philosophy of “meat as condiment,” and really paying attention to where our pork, beef, and chicken is coming from when we do eat it. I don’t know a lot, but I know enough to realize that being able to philosophize about what’s on your table (as opposed to just, you know, getting something–anything! — on your table) is a very luxurious way to think about dinner — especially when you factor in the costs of high-quality meat. If I had to categorize this level of thinking, I’d call it Premier League Family Dinner. And though I can’t play at that level all the time, I aspire to it almost every night. Most recently with this recipe which taps into the idea that a little bit of really good sausage goes a loooong way. In a medium pot, boil lentils in broth-water combo, then reduce heat and simmer for 15 minutes until they are tender, but firm enough to still hold their shape. Drain. 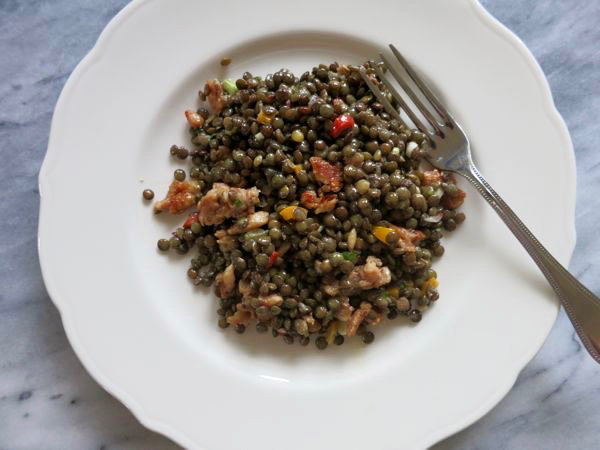 While lentils are cooking, make your dressing by whisking together mustard, vinegar, olive oil, salt and pepper. In a medium skillet over medium heat, fry sausage in a little olive oil, breaking up with a fork, until cooked through and crispy. Remove to a paper-towel lined plate. Toss lentils with scallions, pepper, thyme, sausage bits, and vinaigrette. (You may not need all the vinaigrette — so drizzle it in instead of dumping it until it looks right.) Serve with crusty bread. I think that thinking of meat as a condiment is a great way to promote eating more vegetables (the healthy stuff). I think focusing on great cuts of meat makes the dinner experience all the better. Most nights we all eat together as a family (my little ones are all under 5 and so I am not at the busy teenager stage). I am just enjoying the now. Excellent post- and so useful for so many! My mother, who hates cooking, never really got past Stage 2 the entire time we were growing up, but dinner together still happened on a regular basis and that’s what matters. It’s the gathering together that is important! I think I’m permanently ensconced at Level 2. Level 3 is rare and something I’d like do more consistently and Level 4 might just be a pipe dream. I just tried the precooked lentils from Trader Joe’s. They were quite good and would make this dish even faster. Now that we have a baby finding a few shortcuts like this have helped me get dinner on the table. My Level 2/3: burrito night. Depending on what else is going on that week, burrito night starts the night before with Cuban beans & rice made in the slow cooker. Left over beans & rice become the filling for grilled chicken burritos the next night (or 2 nights later, whatever). I just got back from the store and almost bought sausages. Wishing I had now as this sounds delicious. I think you should add that the levels vary. Last Sunday we had the WHOLE family (grandparents, too!) sitting down to milk braised pork, polenta, zucchini and tomato gratin, arugula salad, and parsnip cake with maple cream cheese frosting for dessert. That preceded a week of bad traffic and worse work schedules, in which I decided by Wednesday that I would not eat crackers and cheese for dinner three nights in a row but instead would vary it with a peanut butter sandwich. In other words, 100% compliance is not necessary. @Kate – I think you make a really excellent point. Thank you! We’re pretty much a level four as, I think, are most of my friends and family. I think here in Europe that things are a bit different. Family dinner is the norm, unless someone can’t make it because they are working late or have some other commitment. in fact in many cases it is almost like an institution. There is much less of a reliance on preprepared meals and much more homecooking. I was always brought up to eat or at least try what was put in front of me, and I am doing the same with my own children. There may be a part of a meal that one or other of the children won’t like but they will try it each time, and always eat the rest. I wouldn’t even consider cooking more than one meal. I guess at the end of the day because we grew up like that it’s easy for us to do the same now with our families. We are stuck on Level 2… as much as I dream of my child eating some form of the dinner we are eating, and I keep on trying for it, he usually ends up with pb toast or tiny chicken burgers as he eats such little variety. Sigh. A couple of nights ago he ended up with apple slices, cheese and crackers as he wouldn’t eat the turkey burgers we were having and which he said he would try but I take comfort in the fact that we are all around the same table most nights for supper. I’d quibble about Level 4 as not all of us really care about where our food comes from on a cosmic level. I’m feeding three very hungry athletic teenagers and it’s important that I get maximum healthy calories and protein into them every night. Here in rural NH, I’d have to travel far and wide to find local meat and there is simply no way I could afford to feed my boys. Truthfully, I’m just fine with that. We eat a homemade dinner together every night and we’re happy for the food and the company. In my opinion, that’s the highest level of family dinner there is. I think it’s so important that you have given people permission to be “not perfect.” I think we all aspire to having our families all eat what we have lovingly cooked and clean their plates. I felt so much better when I realized that it was okay for someone to eat yogurt or cereal if they didn’t like what was on the table. It’s cuts out so much struggle and frees everyone in the long fun. Level 3.5. I’m not sure I have a cosmic level. But I think our CSA counts. Although, now that it’s October, I confess, I can’t wait for our share to end. It’s all good stuff, but so much work! i love the idea of levels, brilliant! also, i think a helpful mantra (provided by my acupuncturist) is: “do what you can”. simple and open to interpretation. No, making family dinner is not ‘easy’, but it’s not impossible either if you make it a priority. If you’re new to cooking, it will involve planning and experimentation. You need to make time to shop and cook, which might mean foregoing other activities in the evening, including driving kids around. So you also have to accept that you can’t do everything, just the things that are most important to you. Also, the oven/slow cooker/microwave/pressure cooker are your friends if you are time poor. We’ve always had the family sit down to dinner, whatever it may be and whoever was home. I was so surprised to hear from my two college age daughters that most of their friends didn’t have “family dinner.” They were grateful that we always carved out a little family time! Your idea of the decontructed dinner has been such an a-ha for us – makes dinner so much easier and has cut down on the pb&j’s. The other thing, and yes it adds time to my meal planning, had been getting input from the family. Ideas this week from my almost 4 year old include artichokes and quinoa pancakes with strawberries. Ah level 4 – my dream! One day, right? We vary between level 2 and 3. Just depends on the night. I am going to go our on a limb and reject Level 3. Why? Because I no longer care if everybody likes what I make. Someone is always going to be upset, so I make things that I know ARE good, and I know they TASTE good, and what you do with that is your deal. I always try to include 2 or three sides that are crowd pleasers: carrots and dip, salad, potatoes in some form or other, etc. And I do have some mains(like, 3) that everyone likes so those feature heavily in the rotation. But I don’t get all wound up if someone doesn’t like what I’m serving. You are free to pick the meat out of the stir fry if that’s all you like. I think it’s important to realize, too, that sometimes eating together is not that fun, especially when you first start doing it. Kids are whiny, tired, have ants in their pants, won’t quit poking each other, yada yada yada. This should not be a deterrent to family dinner. It would be so easy to give up and let them heat something up in the microwave, but if you stick it out, it gets better and you can actually start to have meaningful, mature conversation. I endured years of obnoxious behavior but now my older two are really fun to sit around the table with and even my youngest (7) likes to hear about everyone’s day and tell about her own. It’s worth hanging in there. What would you eat along with the lentil/sausage? It’s a question that often crosses my mind when I read your blog. When my three daughters were athletic teen-agers, we would generally have several sides with a dish like the very appealing lentil/sausage dish. Probably a tossed salad, freshly picked from our kitchen garden, with maybe sauteed yellow squash and fresh-baked biscuits, made with finely-chopped chives or dill. For dessert, if they still had room, fresh fruit, whatever was at it’s seasonal peak (and also was affordable–we often bought a bushel of apples and that was their always-available snack). The reason we could pull this generous meal together most days is because we all worked together, sharing the making of dinner. For us, it was fun! While Level 4 may be a worthwhile goal, how many American families can afford to eat humanely-raised meat and organic produce? I find that several times a week, instead of meat or fish, I rely on free-range organic eggs as the key to a Level 4 meal. I’d love to know more ideas for how to eat well as thriftily as possible. We reside somewhere around a 3.5 most of the time. I would say we eat at the table at least 4-5 nights a week. Thanks to your book and this blog, we have made a concerted effort to cook real food and try new things. We eat 90% organic and/or local and know that we are blessed to be able to do so. We also live the crazy soccer life, so, as you know, sometimes dinner is late, sometimes we eat right after school, and sometimes we pack it to go. We rarely eat on the run or in the car anymore. Even when the husband travels, which is often, the kids and I sit down and eat together (although those meals are often more on a level 2!). Deconstructing dinner helps often for my husband and son, who are picky! Thanks for your blog and your book. It is now my go-to gift for weddings and new babies. Changed my life, yes it did. We made this last night and it was a huge hit with our family, which includes 2 children ages 5 and 2. The dressing really took this to a new level- I was worried it would just seem like lentils mixed with sausage- but the dressing brightened the dish and made it so tasty. To answer question about side dishes- I sauteed diced carrots, onions, and red bell pepper and mixed that in with lentils & sausage before adding the dressing, so it had vegetables as well. Thanks, Jenny! We have a few level 3 dinners (your salmon salad and asian chicken salad among them!). The current one is using acorn squash from the CSA. Kids eat acorn squash, roasted with brown sugar and topped with candied walnuts from Trader Joe’s. Adults eat the squash on arugula salad: balsamic vinaigrette, lentils, candied walnuts, and blue cheese. Maybe some dried cranberries as well. I think I got this salad from a Whole Living cover – I miss that magazine! Like @Margit, I’m a bit puzzled too. I thought we Europeans eat smaller portions than Americans, but if I served that lovely plate of lentils for dinner, my kids would look expectantly at me, wondering where the main dish was. As we ate dinner last night & i basked in the glow of all four of us devouring the same dish i remembered this post & knew i had to comment. Although that dinner was a brilliant level 4, it is not always so,always it is 2 or at times 3. But last night sublime perfection, this is a share but also a thank you because what we ate was my version of your very own teriyaki salmon bowl. Thank you thank you for putting this idea into my head & now allow me to share with you how i have run with it. teriyaki salmon, sauce made from scratch, sushi rice, sometimes i make it short grain brown rice with sushi rice seasoning(from scratch also) but often i give in to the traditional white. That is the basis & then the magic happens, paper thin cucumber rounds (last of the season from my greenhouse) (add daikon if i have it) tosssed in a rice vinegar & umeboshi plum vinegar (my 6 year old swoons for these insta pickles), toasted sesame seeds, always avocado slices, sliced scallions, steamed greens (last night is was garden chard but whatever is on hand), roasted squash (from my plot also) & at least one steamed vegie (rainbow carrots grown by me last night but anything is possible) . Ta da mix & match perfection. I lay it all out on the table & everyone can create their own idea of happiness. So thank you again, even if this is only one meal a week which hits all these points i am a happy cook. Very late to this post, but everyone in our family loves homemade korean tacos. We make dak bulgogi (marinated chicken, which you marinade the night before), asian slaw, store bought kimchi, sometimes wilted asian style spinach, bean sprouts, avocado and sriracha sour cream and anything else we think might work. Everyone makes their own soft taco. The kids might just have a chicken and avocado taco, or might branch out. We always serve it with a few cut up vegetables and everyone’s happy. I love, love, love this recipe for lentils. It has quickly become one of our go-to options. It’s so quick to get on the table and my 7 and 4 year olds will eat it with minimal complaining (obviously a miracle). It’s so nice to be able to hit level 4 once in a while! Wonderful. Love your writing! I’ve been on the hunt for good lentil recipes for me and my wonderful but picky-eater husband. He will eat this! As a lifelong vegetarian who is now moving into solar, non-fossil fuel cooking, I think its wonderful the meat eaters out there are finally pondering where their food actually comes from. It scares me to death when I read stories about how the US government ok’s slaughtered chickens being shipped to China to be “processed” aka injected with salt water from their polluted wells and chemicals by low cost penny laborers, shipped back across an ocean again, and this is sold to you dead chicken eaters as “pure American” chicken because the chickens died in America. It scares me and I don’t even eat that crap, hellllll no. You couldn’t pay me to eat it. I do notice it though, for example when other afficianados post videos of their recipes for solar cooking chicken, that unlike normal veggies, the grocery store bought chicken when slow-cooked in natural sunlight releases what seems like a gallon of some kind of weird liquid substance that pools at the bottom of the cooker. They say this is the liquid that was injected into it to make it weigh more so when you buy chicken at the store, you pay double because of some kind of artificial saline chemical solution injected into it in China. No thanks, OMG, if eating a 6 month old dead chicken that has been deep frozen and shipped back and forth between two continents isn’t disgusting enough for you, lets inject chemical saline preservative liquids that leach out when you cook it and pool in your pan (gag). I did a version of this just last night, but for 1 person. Leftover link of pork dinner sausage cut into little bits, 3 tbsp. brown lentils cooked with 2 crushed garlic cloves in water, 1 chopped scallion, 1 sprig Rosemary, 1 generous tablespoon butter. While the lentils happily bubble away, saute the sausage in a dry non-stick pan oven medium high heat until it starts to brown. Add in the scallion and Rosemary with 2 tbsp. water and let it sizzle down to nothing. Add 2 more tbsp. water. Keep doing this until the lentils are done. Drain lentils and garlic and add to sausage pan, stirring around to make sure every last little pulse gets coated in fat and herb. Tip into a bowl and top with the butter. Enjoy. I kid you not, there is enough salt in the sausage that you won’t need to add any more.